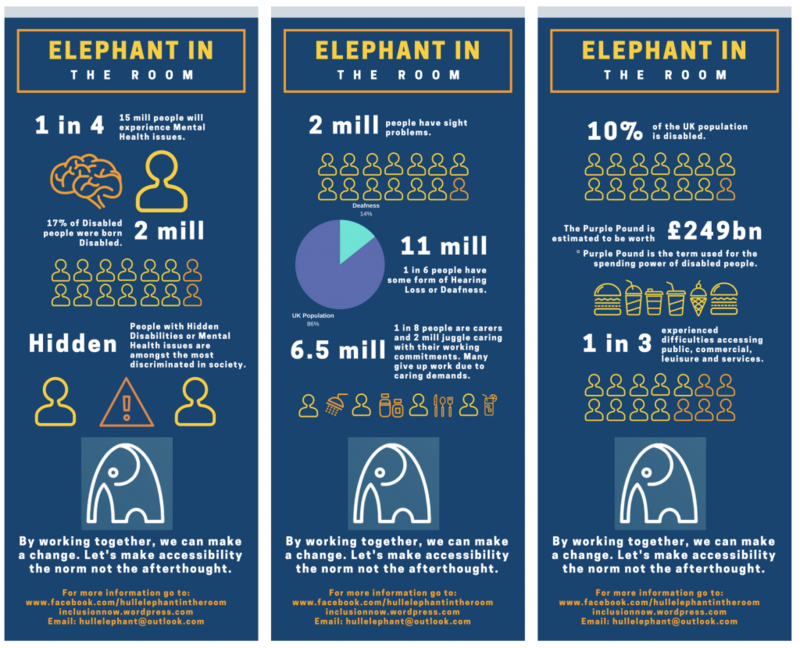 Infographics produced by Elephant in the Room Disability Services, Hull. Standing 6 feet 7 inches tall, with a shock of green hair, and wearing the largest DM boots you’re likely to encounter, Dan Watts is not difficult to see. His character is as warm as his appearance is striking. His disability, however, is much easier to overlook. “I was born deaf, as was my sister. Over the years, I have missed out on so many amazing quizzes, concerts, plays and so on. I felt this was not good enough, why should I or anyone miss out on things on account of our disabilities?” said Dan. The piped music in the popular city-centre cafe where we’re sitting is playing over the chatter of the other customers, so Dan adjusts the settings on his cochlear implant before we speak further. The Disability Discrimination Act of 1995 made it ‘unlawful to discriminate against disabled persons in connection with employment, the provision of goods, facilities and services’. This legislation was superseded in 2010 by the Equality Act, which places a ‘duty’ upon organisations like employers, shops, local authorities and schools ‘to make reasonable adjustments’ to remove barriers that prevent people with a disability from being treated the same as someone without a disability. Now, Dan has founded Elephant in the Room, to help organisations to understand and implement these ‘reasonable adjustments’. “The aim of Elephant In The Room is to bridge the communication gap between the venues/organisations and the disabled, deaf, and mental health communities in the Hull area. We mainly focus on improving access to the arts sector which includes theatres, festivals, art galleries and cinemas. We provide a consultancy service which focuses on accessibility, and we produce a report outlining issues that need addressing,” explained Dan. Dan recently consulted on Absolutely Cultured ‘Urban Legends: Northern Lights’ event, for example. “Absolutely Cultured’s Community Engagement Manager sent me a list of what events were going on, descriptions of what was involved and thoughts on what might need looking at in terms of access. I visited the sites with her, discussing potential issues, such as providing quiet spaces to allow people who find crowds too much to retreat to. We looked at how the route needed to be planned, so that people who have limited mobility or use wheelchairs were able to access the event. There is always something more that could be done,” said Dan. Dan’s enthusiasm and passion for this cause is infectious. He told me, for example, of the differences in how people speak globally, and how that can help the deaf: “outside of the UK people gesticulate more as they speak.” I nodded in agreement. Dan is a prolific blogger, and Elephant in the Room’s website is full of challenging posts, thoughtful advice, and useful resources. Be the first to comment on "Disability is still the elephant in the room"